Hand-printed wood engravings are available from Sladers Yard. 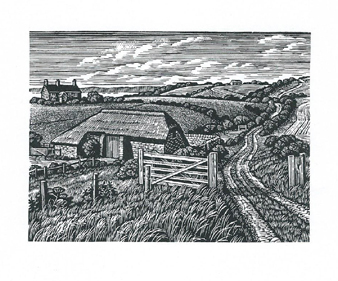 Howard Phipps is a dedicated craftsman and artist who has been producing poetically composed and immaculately executed wood engravings of the West Country landscape as well as still lives and interiors for many years. He was taught the art while still at school. At Cheltenham Art College he learned to paint oils then went on to teach art in a Devon grammar school. His work resonates with that of artists he admires such as Samuel Palmer and Eric Ravilious. He has exhibited widely, including at Sladers Yard, and has illustrated many books including three of his own for the Whittington Press. The limited edition wood engravings he prints himself on an Albion Press dating from 1862 are available from Sladers Yard. Please call 01308 459511 or email gallery@sladersyard.co.uk to enquire about framed or unframed wood engravings. Click on an image to enlarge and/or view as a slide show. Details about the picture should appear if you hover your curser over the image. We are happy to ship/send out unframed prints.